This is the Astronomy page, not the Commentary page. This article deals with a subject dear to the worlds of both science and faith. Our Constitution supports both freedom of religion, and separation of church and state, and I, a “nonbeliever,” support each in this discussion and elsewhere. The idea of a Genesis, or creation story, seems to have its roots in the predawn of mankind. After that, scholars and archaeologists unearthed written documents going back, in some cases, several thousand years. Those earliest writings bore little relation to the much later King James Genesis most of us know today, or to the earlier Hebrew Bereishit (Genesis). One uniqueness that distinguishes the “new” creation stories from the really archaic versions is their description of something being created out of nothing. The universe may have existed forever, according to a new model that applies quantum correction terms to complement Einstein’s theory of general relativity. The model may also account for dark matter and dark energy, resolving multiple problems at once. I got interested in this Genesis angle after examining the proposed new “No Big Bang” model for the birth of the universe. A universe without beginning or end? It’s not proven mathematically or theoretically, and peer review will be merciless. But it does revive haunting metaphysical questions arising out of Big Bang or Son of Big Bang: Is a “singularity” anything? How can something be created out of nothing? Or can it indeed? Genesis? How do we justify THAT? For scientifically-oriented people like me, that’s always been just a lovely metaphor, in fact my favorite part of the OT when I read it as a youngster. I wanted to remember what Genesis actually SAID. I admit to a shock when I went back to read it anew! Genesis 1 King James Version para 1-4 (the Hebrew text is identical here). Let’s refer to the artist’s model depiction of the creation, development and expansion of the universe in its first 13.8 billion years. We can identify, measure and describe each of the four stages depicted in Genesis. 4a. 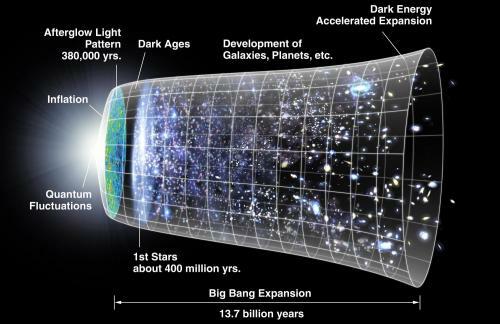 Big Bang: Development of Galaxies, Planets, Dark Energy, Accelerated Expansion. We can see that before Inflation, the universe was dark and without form (so far as we can know). We can see the stars divided light from the darkness, and all of what followed that we observe, measure and chart in the night skies. We might just replace the biblical word “earth” with “universe.” No one can hold it against iron age mankind that they saw a time frame of “The Seventh Day” instead of our billions of years, spectral red-shifts, and Hubble’s billions of light-years. For those of us who’re not religious, isn’t it striking how close to “getting it right” sequentially the drafters of Genesis actually came? Our twenty-first-century scientific advances, which make it so easy for us to interpret a customized and vetted physical timeline of the universe, were not even know to mankind when I was a youth in 1950. Those early civilizations had nothing but their eyes and minds to infer a logical sequence of events. It would be cheap to play the Hollywood “cast of thousands of men and animals” card. God did NOT guide Charlton Heston’s hand in manuscripting Genesis, into what some might be tempted to call an astounding, supernaturally inspired coincidence. Some are compelled by faith to see Genesis as divinely inspired. I see the power of the mind of man to infer and forge measurable order out of the unknown and chaotic. For those of us who are religious, can we not be filled with a sense of awe that our spiritual forebears saw so clearly a right design in the night sky, nature and the firmament? Would this God create an inexplicable design that defied all other laws of His universe? I would certainly expect that logical consistency would not represent a problem for a Creator, even as it appears so inexplicable to some of his creatures. Let’s leave it to theologians to prove or disprove my postulate that a moody, irascible, helter-skelter Creator would be a logical contradiction solely of mankind’s making. We might each do well to pause for reflection again that, whether by divine intervention or nucleosynthesis, we are all, quite literally, children of the stars. If by God, it would seem blasphemous to declare that such a deity could not have both created it in the grand fashion our astrophysicists describe and measure, yet still have left us, an inquisitive and bright mankind of His own design, with an audit trail and the faculties to follow it. Personally, I find comfort in the fact that the mathematics would be the same in either case. Sunrise from International Space Station, NASA Image of the Day, Saturday, Aug. 27, 2011. NASA caption reads, “… astronaut Ron Garan used a high definition camera to film one of the sixteen sunrises astronauts see each day. 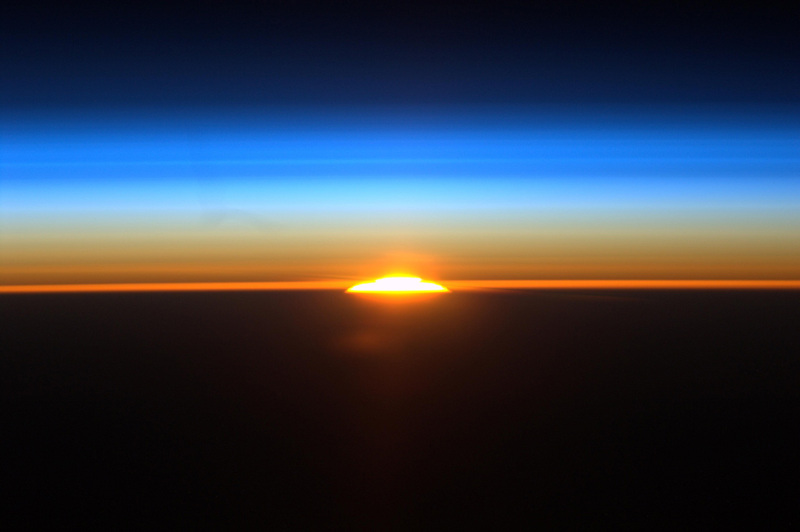 This image shows the rising sun as the station flew along a path between Rio de Janeiro, Brazil and Buenos Aires, Argentina.” Click image to view or download from NASA original post. My first reaction was, “Oh no, not again!” I always maintained Pluto was a “planet,” no matter how the IAU redefined it in 2006. Are we going to revive that old trope again? Well, of course! How did we miss the obvious? With recent discoveries of huge numbers of planets orbiting other suns, we are calling them “planets.” We can’t call them “dwarf planets” because those will be too small for current detection methods for quite some time to come. What the hell were they thinking? Even this WordPress blog post is a wolf in sheep’s clothing, if you’ll pardon the terrible metaphor. Defining something so that it meets a predetermined selection criteria you need it to match is an ancient malady, and it’s not confined to religion and politics. If Mars has all that rust, where did the oxygen come from? We call Mars the “Red Planet” because it has iron oxide – LOTS of it. Where did it come from? Scientists believe both Earth and Mars got most of its surface iron oxides from meteor bombardment about 4 billion years ago. Why does Mars have so much more of it? BBC has done interesting documentaries on stromatolites, large living bacterial beach “rock” formations we can still see and investigate in Australia. According to this theory, these cyanobacteria use a primitive photosynthesis to generate Earth’s earliest oxygen. This started oxidizing particulate meteorite iron dust suspended in the oceans, converting it to rust, which settled to the ocean bed and was sequestered there. When free iron particles were essentially used up, oxygen could then start accumulating in our atmosphere … paving the way for higher Earth life forms. Mars seems once to have had copious water. Could it have also had cyanobacteria? Is that how Mars got all its iron oxide? Well, according to another theory I found on starryskies.com, Martian oceans simply rusted all that meteoric iron away. Of course, if this is the full explanation, we don’t need the stromatolite theory at all to account for iron oxides on either planet. I found a third theory on BioEd Online. It suggests the answer is not that simple. Researchers have been able to show that Earth’s powerful gravitational field generates enough pressure and heat to melt iron oxide, in effect smelting oxygen out of it, and allowing it to sink into the molten core. Theoretical calculations show smaller Mars could not have generated the required compressional pressures. This would account for Earth’s huge liquid iron core and the powerful dynamo generating our planet’s magnetic field, in turn protecting our atmosphere from the solar radiation that we expect blasted most of the unprotected Martian atmosphere away. If all goes well, our new robotic explorer Curiosity will safely descend to the Martian surface at 1:31 a.m. Monday Aug. 6 EDT (0531 GMT) – about 10:30PM Sunday night, Pacific time. Facebook has a Curiosity page, and NASA/JPL will have a “live” feed on UStream’s Curiosity Cam. Curiosity will not broadcast photos until it finishes all its own internal checks. The first photos will be black and white, with color plates following on later transmissions. Remember, there’s currently a 14 minute radio signal delay between Mars and Earth. I plan to try to stay up to see if the mission is successful. As for our iron oxide questions, it often turns out in science there is not just one “right” contributory answer. It will be interesting to see what mysteries Curiosity can solve. Will Earth Perish by Fire, Ice or Black Hole? On last night’s news, veteran PBS news anchor Gwen Ifill interviewed a prominent astronomer to solicit comment on the recent discovery of two enormous black holes hiding in the bright central bulges of the giant elliptical galaxies NGC 3842 and NGC 4889. The scientific news itself went “viral,” being picked up on BBC, The New York Times, Huffington and elsewhere that I can recall, as well as in the scientific journals. The Sky & Telescope article is much more oriented toward readers who are already familiar with cosmological objects and distances. It can be picked up at this link. You can also read the PBS transcript of Ifill’s interview with Chung-Pei Ma. Ma is professor of astronomy at the University of California, Berkeley. She appeared visibly constrained by the problem of how to explain these concepts to a general viewing television audience. how far out do the effects of these monster black holes reach? how far away are we now? how long in years could an approach to within their spheres of gravitational influence take? Both galaxies in question are about 300 million light years away. “For NGC 3842’s central monster, the team found a mass between 7 and 13 billion Suns; for NGC 4889 the range is much bigger: 6 to 37 billion solar masses” [Sky & Telescope]. In other words, each black hole’s estimated bulk suggested it had already swallowed the mass equivalent of an entire “ordinary” galaxy. The “event horizon” of each black hole – the boundary inside of which even light cannot escape the black hole’s unimaginable gravitational field – is estimated at around 3 to 5 solar system diameters. Our Solar System has a diameter of about 0.001 light year. To put this into some kind of perspective, our Milky Way galaxy has a diameter of about 100,000 light years. So, our Milky Way (which has a large black hole of its own) is about 3,000 Milky Way diameters away from NGC 3842 and NGC 4889. Looking at the second illustration in the Sky & Telescope article, and the companion text, it appears that only the the motion of stars within 1,000 light years of their black holes NGC 3842 and NGC 4889 are affected by the nearby dark monsters. We are 300,000 times further way than that. But … but … supposing some cataclysmic upheaval were to propel our solar system, or our planet, toward those monster black holes? How long might it take for them to tear us apart? How fast could an “object” like us move in that direction? Obviously, we’d have to move really fast. Let’s disregard the fact that any catastrophic event powerful enough to do that would also undoubtedly shred Earth to dust, if not elemental gases. A supernova explosion of our Sun might propel an expanding sphere of gases and dust outward at 11 million miles an hour, though it’s a fact our Sun is way too small to go supernova. So, even at the catastrophic speed of one percent of the speed of light (give or take), hurtling straight toward either of those two monster black holes, it would take us something like 30,000 million years to reach a destination 300 million light years distant. The universe is currently 13.7 billion years old. Cosmologists think it might be good for another 10 or 20 billion years or so before perishing in fire, or ice, or whatever. In short: since 30,000 million years is 30 billion years, the universe may not even exist by the time a battered Earth arrives at NGC 3842 and NGC 4889 at the improbably high speed of only one percent of the speed of light. Any slower than that, we’d never arrive, nor would there be any destination to arrive to. I don’t think we have to worry about it too much. For the full story see the NASA Hubble site: NASA/ESA managed to combine the powerful Hubble Space Telescope with the incredible sling-shot magnification of gravitational lensing to produce what appears to be mankind’s first visible-light image of an accretion disk. .
Maybe you’re feeling fed up with the economy, being out of work for two years, global warming, a dysfunctional congress, the UK rioting, and the current political campaign lineups. Are you thinking it’s nearly time for mankind to journey to the stars for a fresh start? It doesn’t look like we’re quite ready for prime time. I updated my time and distance spreadsheet on my November 10, 2010 Astronomy posting “Interstellar Time and Distance.” This came about thanks to a reader question about distances and times from the Orion Nebula (M42). That calculation has enough steps that I fluffed them on my PC calculator. So I redid the spreadsheet, adding Neptune and Orion M42 to the range. For good measure, and comparison of the vast difference between interstellar and intergalactic travel distances, I also added the Andromeda Galaxy (M31). If Pioneer kept chugging along at 132,000 miles per hour to the nearest star, Alpha Centauri, it wouldn’t get there for almost 30,000 years. Scientists think we may attain higher speeds around 0.1% of the speed of light within the next century. This might enable future space travelers to get to the Orion Nebula in only 1.2 million years. Better stick to Alpha Centauri at 3,900 years, which will be do-able, though at enormous energy, construction and human cost. If a colonization team left now for Alpha Centauri, and another left in year 2111, the second team would probably arrive about 26,000 years before the slower first team! But you’re thinking, “we’ll have Star Wars technology by then.” Unless we discover real live Wormholes and figure out how to survive that transit and predict the destination, travel at even 10% of the speed of light would get us to Alpha Centauri in about 42 years. That would be nice, but it’s still pure science fiction. Light from our closest galactic neighbor, Andromeda Galaxy, takes 2.5 million years to get here. There’s absolutely no use in even speculating: we’d need at least 25 million years travel time to get there! If you don’t already know about NASA’s Image of the Day program, you can follow the link below to their page and add your email app or social media to their RSS feed through the page’s Connect tab. You can download stunning images daily in a choice of image sizes. Below: “The Cassini spacecraft observed three of Saturn’s moons set against the darkened night side of the planet in this image from April 2011.” NASA. 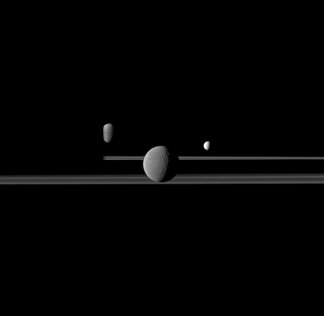 Pictured are Rhea, Enceladus and Dione. Is Reality Digital or Analog? I stumbled across this question in a Scientific American RSS feed. Does it really ask what it seems to? Unfortunately, that seems to be the case. This is what happens when you let a bunch of physicists loose in a sandbox and ask them to define it. I have to be careful in framing my criticism of the real question posed here, since I lack any credible qualifications for judging questions of quantum mechanics. What I submit instead is that the “definition” of reality does not fall within the jurisdiction of the laws of quantum mechanics (whatever those turn out to be), any more than the glorious majesty of Half Dome or the Grand Canyon falls within the jurisdiction of the traffic court division of the Superior Court of California, County of Kern. The annual “Two Moons on Aug 27th” Mars e-mail is circulating again. Alas, the myth is another internet hoax, a best fit for the “liar liar pants on fire” category. Amateur astronomers already know this. This year, for the benefit of everybody else, we do our best to explain why. The photo above is also true to my own experience, as I’ll narrate below. Although nearly all of the claims made in the e-mail are true, the hoax stemmed from a misinterpretation of the third sentence of the second paragraph which states that “At a modest 75-power magnification Mars will look as large as the full moon to the naked eye”. The message was often quoted with a line break in the middle of this sentence, leading some readers to mistakenly believe that Mars would “look as large as a full moon to the naked eye” when, in reality, this only applies when a telescope with a 75-power magnification is used. This is the most likely source of misinterpretation. We will never, EVER see a sight even remotely like the faked “two moons” e-mail image from Earth (or from anywhere else in the solar system). And 2010 is not even a particularly good year for telescopic viewing of Mars. We already had Mars’ 2010 “closest approach” in January . Most non-astronomer citizens never would have noticed it. Phoenix and Bay area residents would probably be unable to see it with the naked eye unless it was an exceptionally clear night. We actually have mathematical “closest approaches” every other year or so (Mars takes 687 Earth “days” to orbit the sun). Obviously, since both planets orbit the sun, there is always going to be some “closest” distance as the Earth swings round past Mars. That distance is not the same each year because the orbits if the two planets are not quite concentric, but elliptical — not quite perfect circles. Mars’ orbit is quite eccentric for a planet – about 9% longer on the long axis compared to the short dimension. 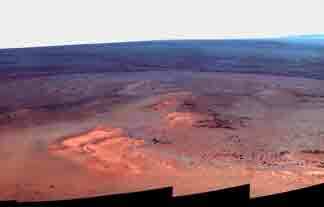 In 2003, we had the celebrated closest Mars approach “in 60,000 years”. Astronomers would have noticed Mars having an apparent diameter of almost twice its “farthest distance”. This difference doesn’t become readily apparent without a telescope of at least 6″ diameter. The angular size of the Moon is about 1/2 degree (30 ARC MINUTES). By coincidence our Sun is of the same apparent diameter, which is why we can have perfect lunar eclipses. NASA confirms the angular size of Mars varies from a minimum of 3.4 ARC SECONDS to a maximum of 25.1 ARC SECONDS. An arc second is 1/60 of an arc minute. Mars never stood a chance of looking close in size to the Moon! 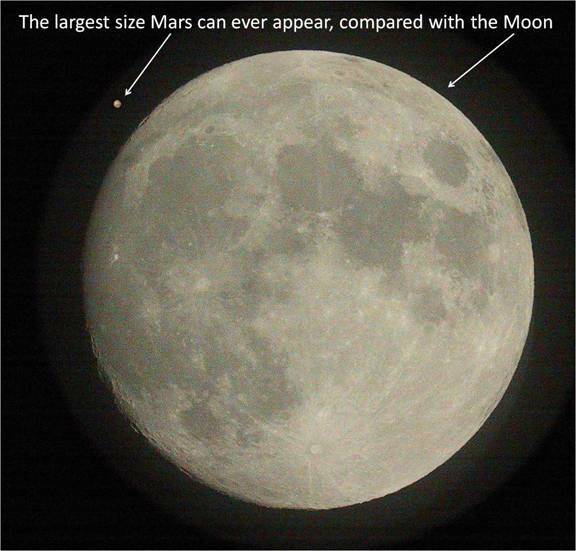 Even at its closest approaches Mars seldom appears larger than 26 arc seconds, or about 1/69 the apparent size of the moon. Some sources compare this to the apparent size of a penny at 500 feet. We all know from experience the Moon NEVER looks about the size of a penny at 500 feet. The Moon might look more like the size of a basketball at 100 feet. So how could Mars ever look like it was almost the same size? It can’t. If that isn’t bad enough for backyard astronomers, more math (groan) conspires against us too. Remember that the area of a circle is proportional to the square of the radius. So, a planet of radius 1/2 will only display 1/4 the surface detail of a planet of radius 1, all other things being equal. A planet of radius 1/60 can, at best, display 1/3600 the surface detail of the larger one — not counting the distorting effects of the Earth’s atmosphere! The 2003 Mars approach was a HUGE disappointment to Bob and me, and we (I) wasted a good deal of money trying to be ready to photograph this highly publicized event. As actually viewed with the naked eye in 2003, it was hard to tell whether any kind of “disk” of Mars could be made out at all, or if Mars was just a really bright reddish point-source star like Aldebaran. With eye to our telescope eyepiece, we were barely able to see Mars’ polar icecap, but that was all. 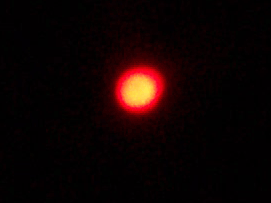 Bob and I tried to photograph Mars through the 8″ telescope with an expensive SLR camera body, without much success as we were inexperienced in photographing the night sky. Bob did the best job, holding up a “Brownie point and shoot” to the telescope eyepiece. Our photo looked about like a penny at 500 feet. Copper-red, no surface detail visible at all. Unless you blow up the image (below), Mars looks like a little red dot in a huge black frame. This photo has been published here before. For a better color photo (looks like black-and-white), see also our Mars Elusive post (9-17-2003). The next “good” year for viewing Mars will be 2014, and it won’t get as good as 2003 again during our lifetimes. Future | dfijordancoulson on Houston Mega-Dome?